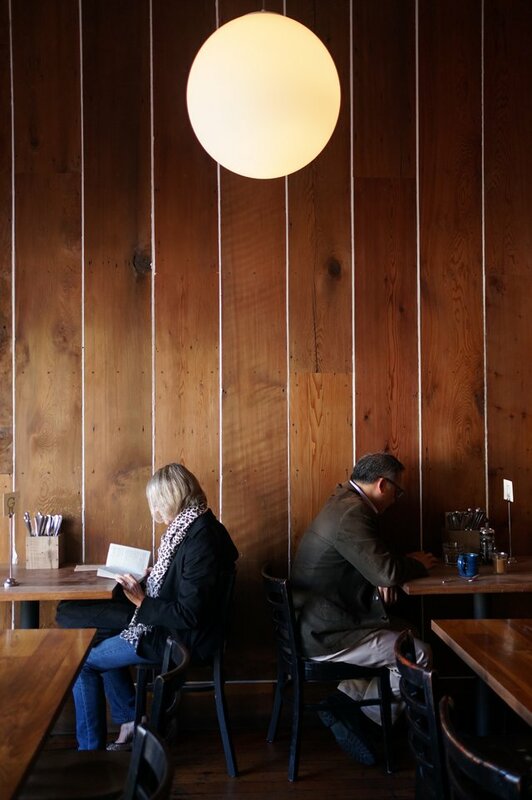 Bar Tartine is about as San Francisco as it gets. 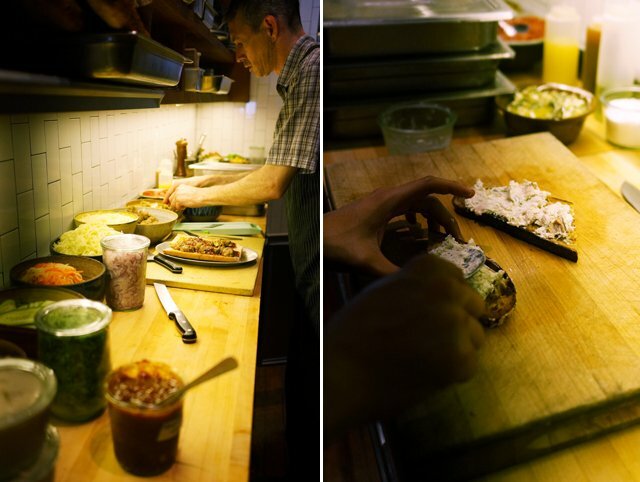 The menu is inspired by the local produce and almost everything is made from scratch. 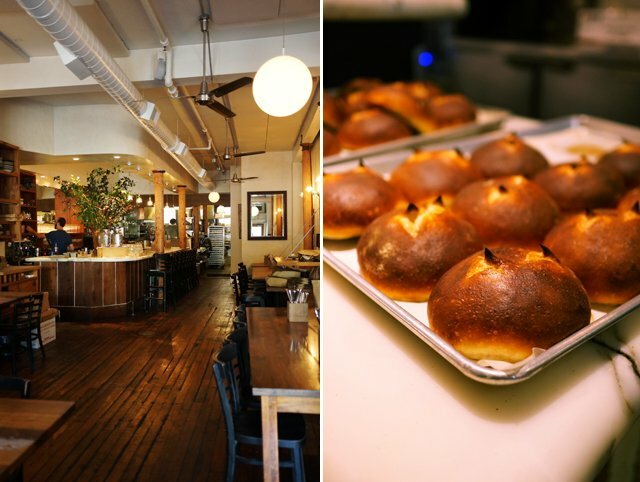 Although they change the menu from time to time, co-chefs Cortney and Nick have an uncategorizable approach to the food at Bar Tartine that is best described as globally inspired. The dishes may vary in flavors from Eastern European to Middle Eastern but are executed with Japanese techniques like using a dashi stock. Last week, I had the pleasure of meeting Cortney and getting a behind-the-scenes glimpse at their sandwich shop. 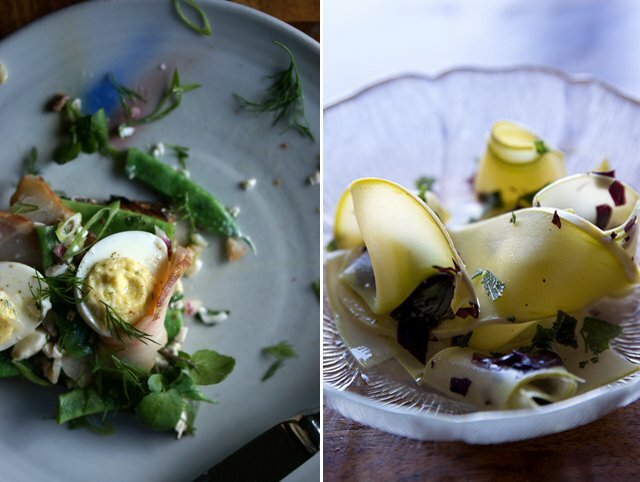 One of my favorite things Nick and Cortney do at Bar Tartine is their pickled veggies — they pickle just about everything. 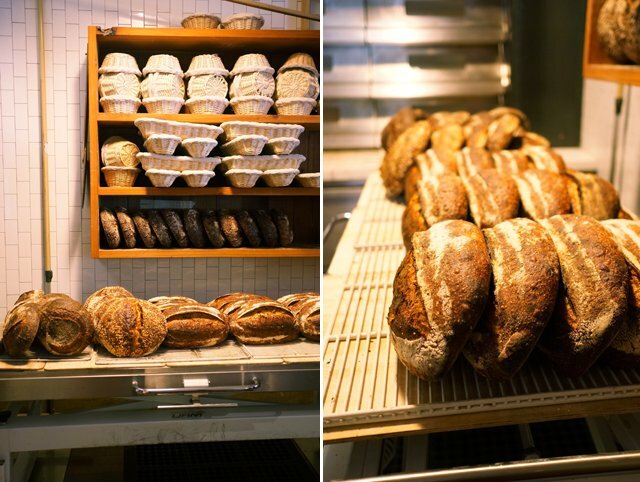 They’re the perfect accompaniment to Bar Tartine’s sandwiches that feature their phenomenal bread. 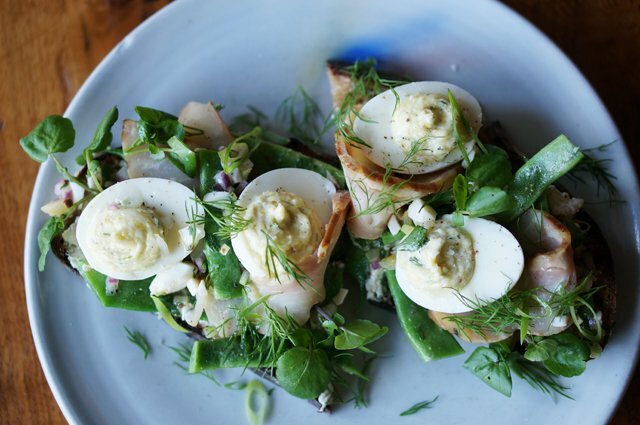 I mean, honestly, smoked sturgeon deviled egg sandwiches? It doesn’t get much better (or more stunning) than that. 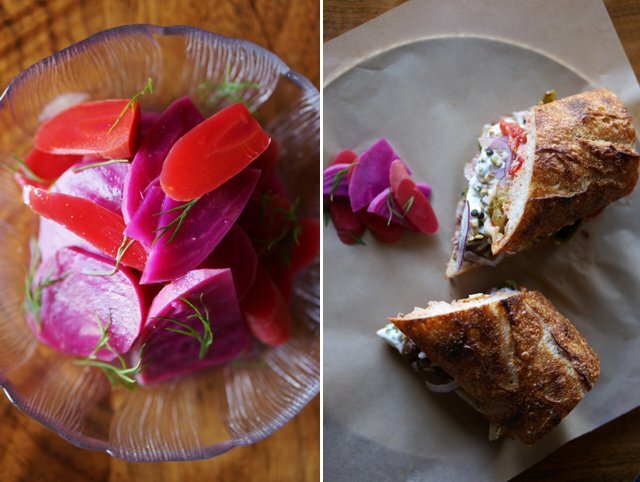 Jump to the bottom and check out Bar Tartine’s recipe for pickled dilly beets that they graciously shared with me! 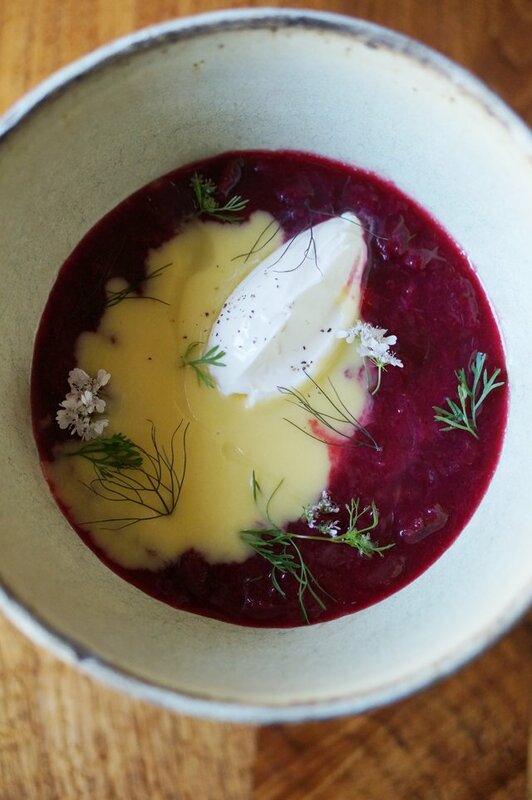 Chilled plum soup with fennel and sour cream. Smoked sturgeon with deviled eggs and green beans. 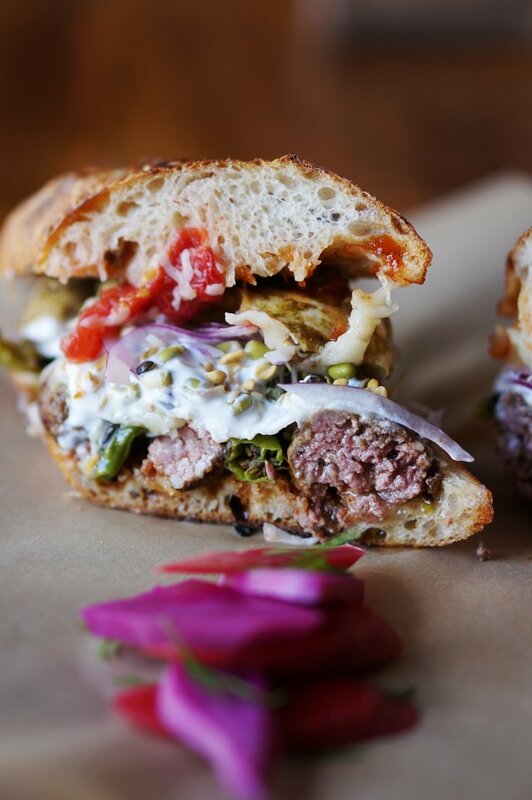 Lamb sausage hoagie with eggplant, yoghurt and peppers. Peel beets. You can either leave them whole, or cut them for faster fermentation. Place them in a container large enough to hold them submerged in their brine and gently weighted down. Determine how much water you need to cover your beets in the container, and dissolve salt into the water. Our ratio for the brine is 1 tablespoon salt/cup of water, which in large batches of pickles is 1 cup/gallon of water. To create a flavorful brine, purée peeled shallots, peeled garlic, and raw serranos in a blender with some of the salted water until the aromatics are finely minced and homogenous. Pour this back into the master brine, add dill sprigs, and any other desired aromatics (black peppercorns, coriander seeds, mustard seeds, fennel seeds, and/or bay). It is best to weigh your bobbing vegetables down with a plate and a weight, or a bag filled with brine. If you seal the container with a lid, make sure to “burp” it from time to time to release the carbon dioxide that builds up in the chamber. Leave the beets at an ambient room temperature, around 60-70 degrees, for about a month. 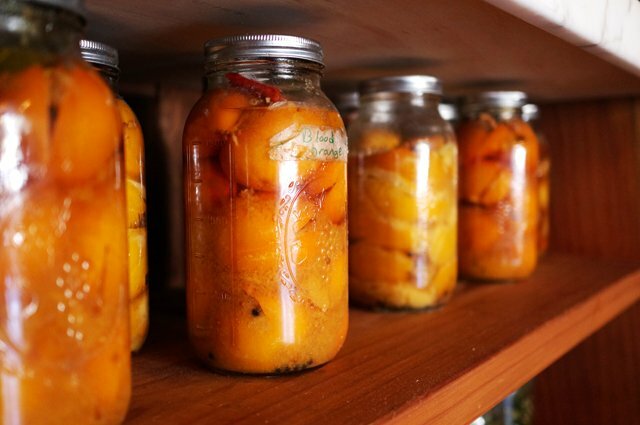 They will begin to ferment within a few days, and you may eat them whenever you desire. If you wish to slow fermentation and hold the pickled beets for a long period of time, you can place them in your refrigerator. Once you are ready to serve, mix the beets with some brine and sour cream, garnish with fresh dill and black pepper, and enjoy as a condiment or snack. 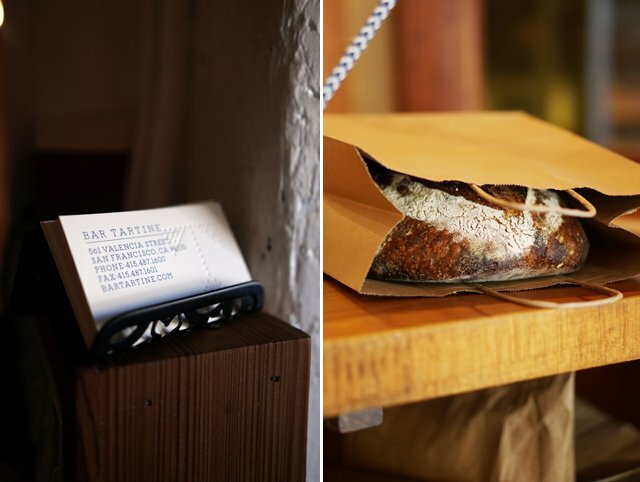 I’ve been to SF a number of times, but I have yet to go to Bar Tartine. I need to make that a priority on my next trip. Gorgeous photos! 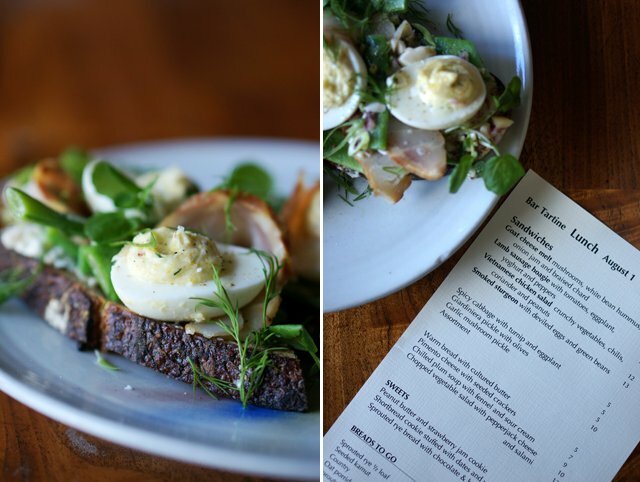 I loved the deviled egg and smoked sturgeon sandwich, so tasty! I can’t wait to try more!